Learn about the German Shepherd’s diet, origin and health to discover what makes this breed unique. Originally a herding breed, the German Shepherd pedigree soon showed just how versatile it could be with its aptitude for many different types of work and service, including within the military – even as far back as the First World War. The first breed club was formed in 1881, but since then, the German Shepherd’s evolution has been considerable; they are now one of the most recognised breeds, and one of the most successful working dog breeds on the planet. Robust, strong and deep chested, the German Shepherd is well-muscled and slightly longer than it is tall. Its bushy tail is moderately long and has a gentle curve. There are two recognised coat types, long and short. Short-coated dogs should have a hard, straight coat lying close to the body with a thick undercoat – this slightly longer hair may form a ruff in some animals around the head, ears, legs and paws. In long-coated dogs, the thick coat and thicker undercoat is still present, but with additional distinct tufts in and around the ears, as well as feathering on the limbs. In regards to German Shepherd grooming, they must be brushed thoroughly once every six months – which makes the German Shepherd one of the lowest-maintenance breeds. If your German Shepherd’s shedding more than can be expected, please speak further with your vet for their expert opinion. German Shepherds’ coat colours are typically either Black, Black and Gold/Tan, or Sable. Extremely loyal, the German Shepherd is a true “one person dog”. Steady, confident, adaptable and courageous are all words that describe this breed. When it comes to German Shepherd Dog Training, they are very quick to learn commands under the right training. 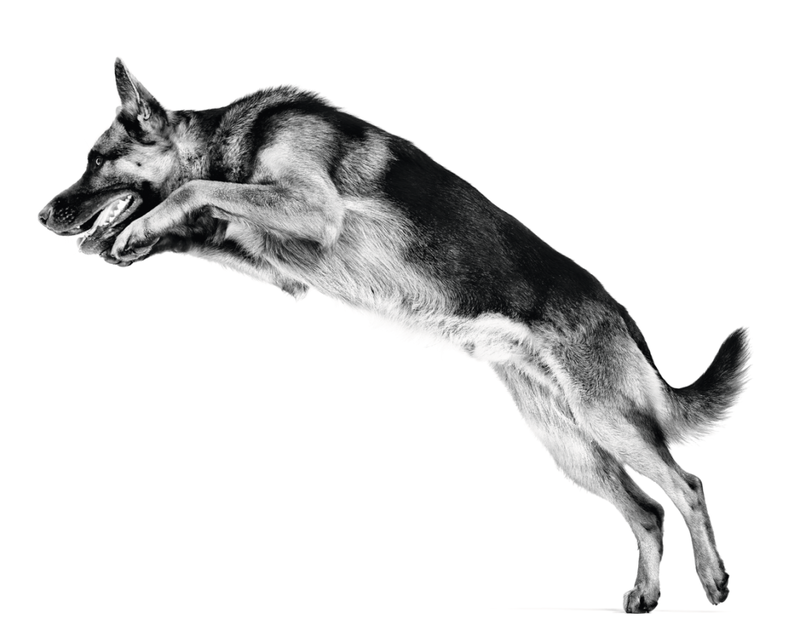 The proficiency with which German Shepherd’s exercise, alongside the renowned German Shepherd intelligence, make this breed the most frequently used working and rescue dog worldwide. As a large breed, the German Shepherd puppy has a lot of growing to do, and this process is slow and steady – 15 months to be exact. 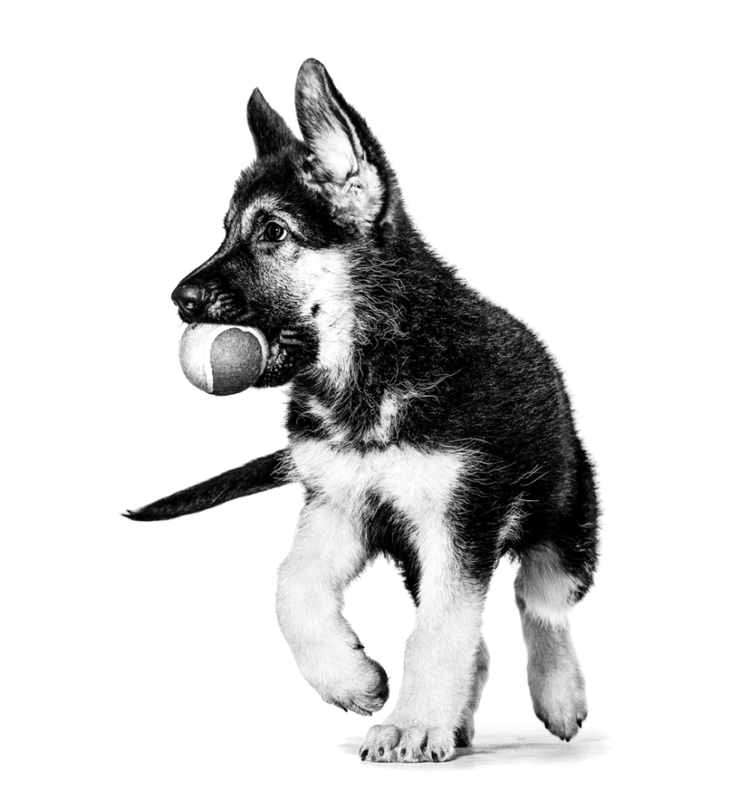 This allotted time with the right German Shepherd puppy care and the right puppy food will allow plenty of time for the bones and joints to fully develop. The right puppy nutrition will also help this breed maintain an ideal bodyweight throughout the standard German Shepherd growth period. Many puppies experience sensitive digestion at some point during their growth, but for the German Shepherd, this is a common concern. That’s why they benefit from a diet which recognises this specificity through an adapted combination of nutrients; including specific fibres such as prebiotics to promote a healthy balance of intestinal flora. Ideal German Shepherd puppy food: ROYAL CANIN® German Shepherd Puppy. The German Shepherd adult is large, strong and athletic. Its joints typically work hard as a result, which is why this breed can benefit from some additional support such as EPA/DHA from fish oil. The German Shepherd’s sensitive digestion often continues into adulthood, so it is important that their diet is adapted to support this. A suitably adapted diet will help maintain digestive health with a selected combination of prebiotics and highly digestible proteins – this will help to limit intestinal fermentation and improve stool quality. Essentially, the ideal, adapted diet will effectively contribute to maintaining your German Shepherd’s health. Ideal adult German Shepherd food: ROYAL CANIN® German Shepherd Adult.